There is no way back: Insects will become part of our food supply. 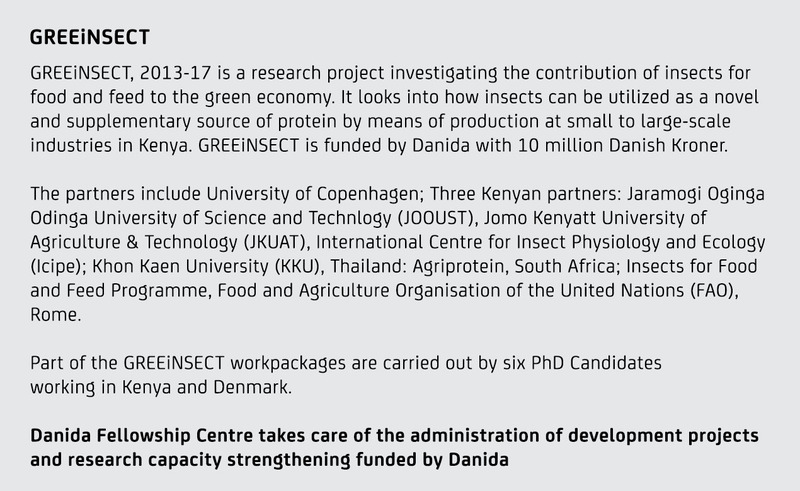 In Kenya, GREEiNSECT, a 10 million Danish Kroner research project funded by Danida, explores what it takes to use insects as a sustainable food and feed source. In a future world in dire need of climate friendly farming solutions, and a predicted shortage of animal proteins to the fast raising global population, using insects as food makes sense. Insects are rich in protein and less harmful to the environment than rearing beef or chicken. Besides, insects as food is neither a new nor unknown phenomenon. Around the world, there are over 2,000 known edible insect species. Most of these species are harvested from the wild, but around nine insect species are currently farmed for food and feed. With the project GREEiNSECT Nanna Roos has spent the past five years exploring different aspects on how to use insects as a sustainable food and livestock feed source in Kenya together with colleagues from University of Copenhagen and three research institutions in Kenya. Kenya, like many other places in the world, suffers from food insecurity and malnutrition. Industrial production of insects may help solve some of the challenges, says Nanna Roos. When GREEiNSECT started, it was pretty much from scratch. To get some inspiration the project partners looked to Thailand. In Thailand, there has been a substantial development in this field. Thailand is a model for the whole world when it comes to insects as food, says Nanna Roos. She explains how the Thai Government in the wake of the Asian crisis in the 1990s called on the country’s universities to explore initiatives that could generate a sustainable rural economy. Khon Kaen University in Northeastern Thailand responded to the government’s call by experimenting with cricket rearing. In an interactive process with farmeres at village level, they developed a production system where the insects are kept in pens. As a farming system, the pens make it relatively easy to keep the insects as livestock and also to scale the production. According to FAO, there are currently 20,000 farms in Thailand operating more than 200,000 rearing pens with more to come. The Thai knowhow and the Asian-African knowledge sharing proved to be a great source of inspiration, says Nanna Roos. While the Thai partners offered inspiration, University of Copenhagen provided linkages to international network and knowledge about robust research methodology. Capacity building is definitely the biggest contribution from our side – something we can be proud of, Nanna Roos says. One of the partner universities in Kenya, JOOUST University recently won a 6 million USD World Bank grant to build an East African Center of Excellence for Insects and Food. University of Copenhagen will support the development of a new curriculum program to make a Master’s Degree Program and a PhD program in insects for food and feed. Nanna Roos sees the coming center of excellence as proof that the university has raised the level of research. Without the capacity building, the university would have been less equipped to apply and win. Nanna Roos attributes part of its achievement to Danida’s support. The competition to become an African Center of Excellence is fierce. Without GREEiNSECT and Danida’s support, JOUUST University might not have been in a position to win the World Bank grant, Nanna Roos says. GREEiNSECT ends in December 2017. University of Copenhagen will continue the collaboration with the Kenyan research partners as the international partner of the new East African Center of Excellence for Insects and Food.